Brisbane, Maryborough, Rockhampton, and Mackay! Certificate II in Security Operations. Morrissey Training is a well-established Registered Training Organisation, (RTO), delivering Vocational Training in a variety of subjects. Your ability and experience to deliver other courses on our Scope of Registration would be an advantage. 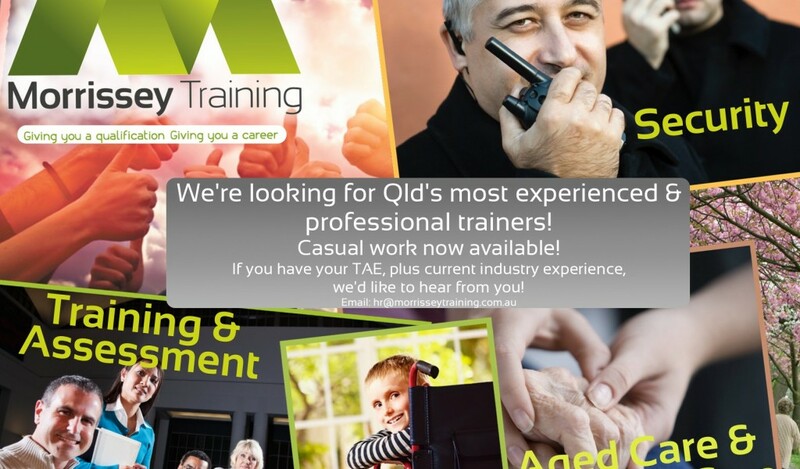 As a casual trainer, you will have excellent communication and time management skills. You will be well groomed and enthusiastic about delivering training. Experience in delivering training is essential. We are able to coordinate our training dates with your availability. Hourly rate is negotiable pending experience.